"I want my hearing back!" Eavesdropper was originally titled Patient 14, and aired as such on the Lifetime Channel, but whether or not that was writer/director Andrew Bakalar's original set of choices remains uncertain. It was shot an indie feature, and I'm guessing the Lifetime arrangement came later, and I don't imagine it was quite what he had planned when he started out, because it seems most films that land on that particular cable channel follow the simple rule of "women good, men bad". And Bakalar's film, a low-budget thriller about secret experiments gone bad and government-controlled mindreading seems to go against Lifetime's typical cookie cutter storylines. Lucy Jenner plays Liza, a woman who in the opening moments loses her hearing during some kind of violent robbery when a gun is repeatedly fired next to her head. Now deaf and alone (some of the details of the hows and why seem a little fuzzy), Liza is cared for by the kindly Grant Kane—portrayed with doe-eyed niceness by John J. York—at his Transitions shelter. When word of an experimental hearing restoration project arises, Liza becomes one of fifteen patients treated with a dose of genetically-engineered infusion cells, but of course no one has bothered to tell anyone that the rats used in testing all went insane. And when Liza emerges from the project with the ability to hear thoughts, the evil U.S. government—represented here by Costas Mandylor and Tucker Smallwood—want to use her for all sorts of secretive, civil-rights-defying purposes. Bakalar claims this film is based on true events from the late 1990s, something known as Project Hidden Lines, though whether that's fact or not doesn't really impact the events of the story as presented here. The premise of expanding the human hearing range is an intriguing one, and Jenner's Liza has to deal with things like the loud thwapping of insect wings and eventually hearing the thoughts of others, but the government-sanctioned situations she is put into seem a wee bit hokey. The thought reading bits are sometimes unintentionally funny, because if I talked to myself as much as these characters do—speaking in long, descriptive sentences—I would probably go insane. I liked Jenner's distracted, nervous performance here (at least in the two-thirds, before she becomes more in control), and from a technical standard the audio mix does an effective job portraying what is meant to be an overwhelming wave of sounds she is presented with on a constant basis. Some of the government mumbo-jumbo and posturing came across like broad cliches, and unfortunately the necessary level of conspiratorial drama loses its way. Image Transfer Review: The 1.85:1 anamorphic widescreen transfer is a bit grainy, and edge detail is noticeably soft. Likewise colors have a somewhat softer hue, with fleshtone levels looking inconsistent throughout. This is far from the sharpest, crispest transfer I've ever seen, but it was a small budget feature so I'm going to a little lenient. The print itself is largely free of any major debris issues, save for a few instances of specking in the last few scenes. An effective-in-its-own-right 2.0 surround track is also included, but only use it if you're not 5.1 compliant. 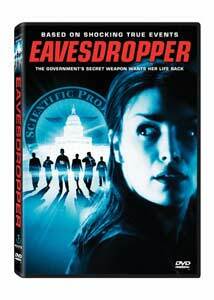 Extras Review: Writer/director Andrew Bakalar provides a commentary track, where he states his film is "not science fiction, but science fact", and conspiracy buffs might appreciate his secretive nature when talking about the real-life events Eavesdropper is supposedly based upon. A large part of the track is Bakalar rehashing what we're seeing onscreen, though near the end he talks of changing some of the "thought" dialogue to prevent an R rating. But considering the film is rated R, and the original title (Patient 14) was changed, I'm left wondering how much was done without Bakalar's input. The other extra is a standard issue behind-the-scenes piece (12m:18s), which is mostly Bakalar—and a handful of cast members—pumping up the project (still known here as Patient 14), intermingled with production footage and much talk of using "sound as a character". In addition to three trailers (Eavesdropper, The Rockville Slayer, Dirty Deeds), the disc is cut into 9 chapters, with optional Spanish subtitles. I liked the overall premise of Andrew Bakalar's directorial debut—especially the use of sound—but too many stiff dialogue sequences had my eyes rolling up into my head. A nice performance from Lucy Jenner is swallowed up by a handful of scenery chewers, but I'll hand it to Bakalar for making a feature that looks (in spots, at least) like it cost a whole lot more.